C, Z purline machine(website: xinnuochina. com/czpur/38. html) adopt high strength steel plate and shaped after cold forming, it has wall thickness homogeneous, size and dimension can be adjusted, big compression strength ect characteristics. The C purline machine which after cold forming, although the section dimension is light, it corresponds with carrying capability’s feature for roof purline and makes steel’s mechanical efficiency into full playing. It can make the C, Z purline can lighten the construction roof’s weight, reduce project steel quantity. So it becomes economic high efficiency steel. It is new building material instead of angle iron, channel steel, steel tube and tradition purline. C, Z purline and light metal tile using together is the best choice for light steel construction. The C, Z purline’s use has following features: Light weight, low cost. Simple construction, the purline can be cutting length well by professional processing plant, punching, finished at the same time, when carrying to construction plant, it can be installed directly. 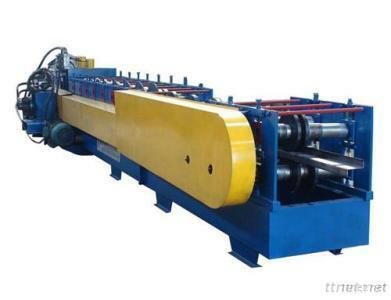 y the roll of Z type purlin Z steel forming machine has good flexural compression performance, straightness is good, completely automatic fixed-length cutting, automatic punching, high automatic degree, installation fast and convenient. Products can be used as the main body of large and medium-sized industrial and civil building load-bearing structure, such as workshops, warehouses, engine library, hangar, exhibition halls, theaters, stadiums, bazaars, mounted metope roofing load-bearing load and support.